If you’ve been reading this blog for a while you’ll know that I love both of these two books. But I couldn’t leave them out of my review month, and I know that there’s extra people reading this now that Mofo is on too. I’m lucky enough to have visited Millennium three times. The first time we went was before I was vegan, and I sat through a whole 3 courses without even realising I was in a vegan restaurant! It’s an amazing restaurant and if I found a genie and a lamp and it offered me a flying trip to any one restaurant, I wouldn’t even think twice about going back there. I also love the books because they symbolise how far I have come as a cook. I originally only bought them because I’d enjoyed the restaurant so much, but after a few glances through I put them away because they just seemed impossible. Over the years though, each time I pick them up I’ve found them more approachable and enjoyable to cook from. There’s no denying that the recipes are time consuming. There are very few recipes you could knock up after work (though there are a few). Some of them need some unusual ingredients, but again after a few years of vegan cooking, my cupboards are better stocked and there’s only a few things I can’t get.You need to read every recipe very carefully because they will quite often use an ingredient which is actually another recipe from the book. The books are quite different. I like them equally but certainly Artful Vegan is more elaborate. It has more and better pictures and is generally a more refined and upmarket book. Millennium still has some of those rcipes, but also includes more basic pastas, risottos etc. So the next time you have a day to yourself and its raining outside, put those DVD box sets to one side and spend a rewarding afternoon cooking yourself some great upmarket food. 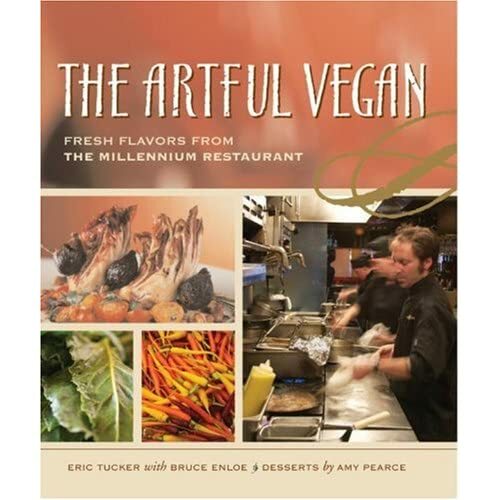 This entry was posted in Artful Vegan, Millennium by efcliz. Bookmark the permalink. I dream about the day I can visit Millenium! It sounds like a magical place. Maybe I should just get the book for now … and pretend. so far millennium has been my favorite meal of all time. the key lime pie is good. seriously, you will not know avocado is in it. another thing you can do is use parts of their recipes. i know i’ve done this. Just looking at that recipe list makes me want to run right out to the bookstore now. I hope I get to eat at Millenium one day. All your cookbook reviews are awesome. You write about books I saw somewhere and then forgot about them. Like “The artful Vegan.” I think I saw it in Norway. I should really put it onto my list now. These books sound intriguing! I love fancier recipe ideas. I recently bought I book called Great Chefs Cook Vegan, though recipes in there are so complicated and intricate I don’t know that I could ever make one at home! These 2 books are my favourites on my bookshelf, save my sourdough ones, but man cannot live on sourdough alone. I had no understanding of vegan cuisine until you mentioned them, and I’ve been blown away by the dishes I’ve tried. Isn’t tempeh delicious. I’d never have tried it without leafing through these 2 books. & the vegan cream options in there taste rich and rewarding. The downside has been mentioned, some of the recipe processes are rather busy. But in fairness, at the end, they are easily brought together and plated up. Lovely books, and a well judged review from you too.